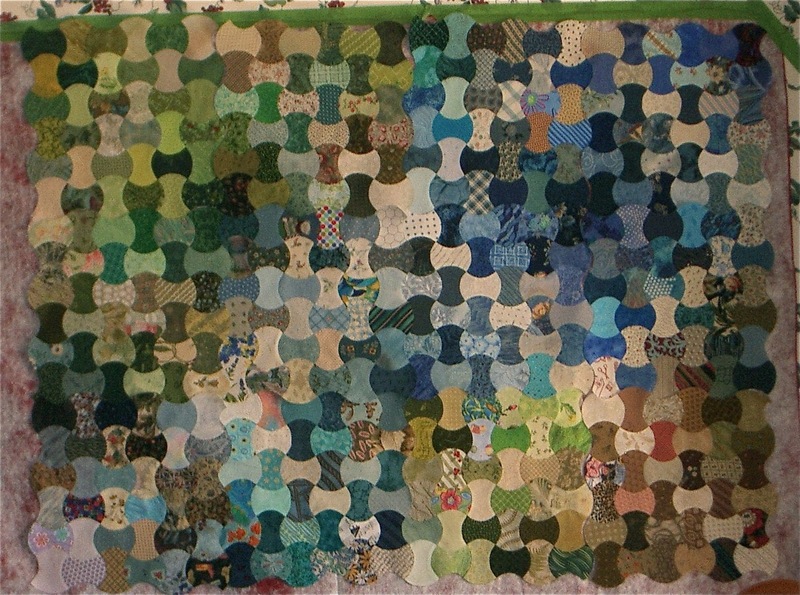 Still working, working, working on the old house, and new quilts. 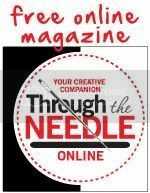 So blogs have been few and far between. The newest project on the house: new shower floor, repairs to entry doors, repairs to two holes in the garage ceiling, (Someone apparently wasn't careful where they put their feet when working in the attic above the garage.) and more. The newest project in the sewing room: One patch quilts for a new book proposal. One patch quilts are sometimes known as "Charm Quilts", but not all one-patch quilts are charm quilts. 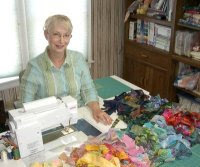 The usually definition of a charm quilt is that it is made up of a single shaped piece throughout the quilt with each piece being cut from a different fabric. Most end up with well over 1,000 different fabrics in them. My first charm quilt was made up of 4"-long kite shapes. I cut many, many of the pieces, then sorted them by color and value. Then 3 light and 3 dark pieces of the same color family were put in a ziploc baggie and these baggies were packed in my computer bag and the pieces were stitched by hand into hexagons. 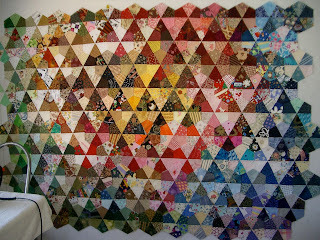 When I had a bunch of them constructed, I stitched them all together after playing with settings on the design wall. I was so surprised to discover that when arranged on the wall, the hexagons formed 60° triangles. 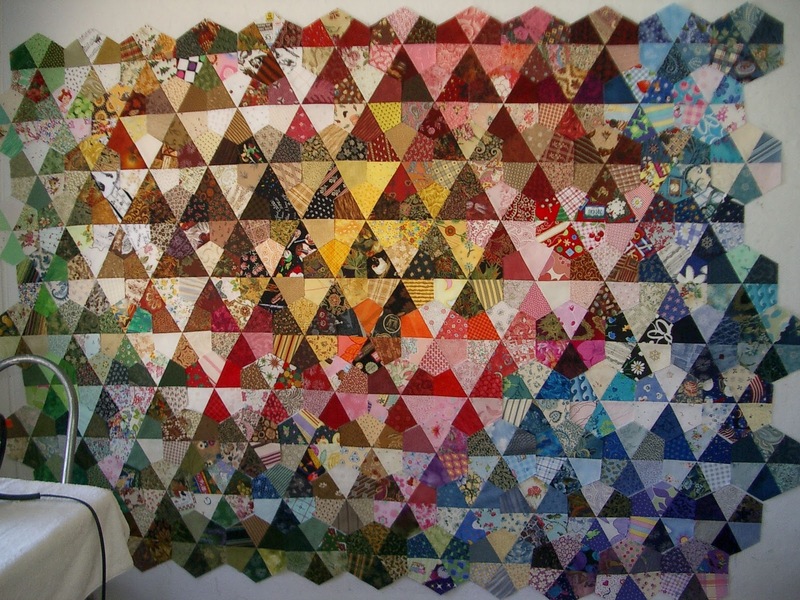 It was attractive, but it would have been so much easier to have stitched the pieces together as triangles first, instead of hexagons. My next charm quilt is in process. 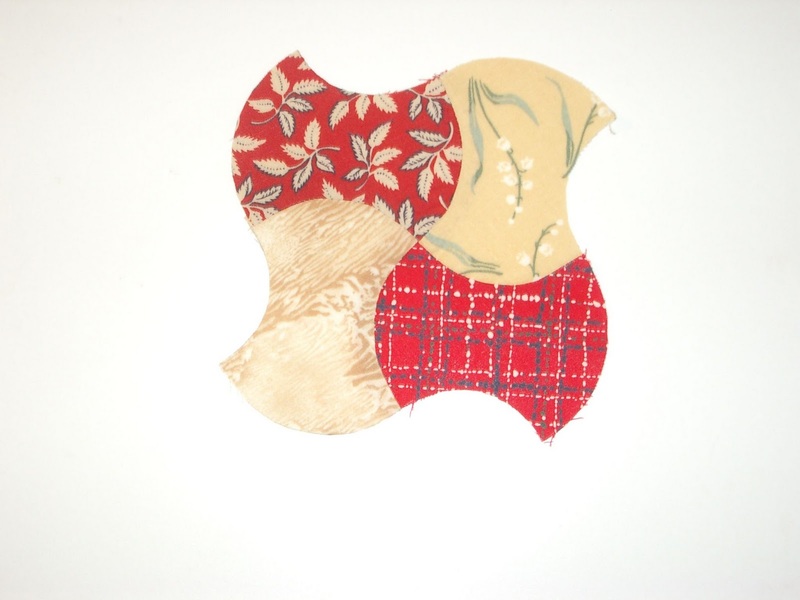 It is made from a patch shape known as 'apple core' or 'hatchet'. 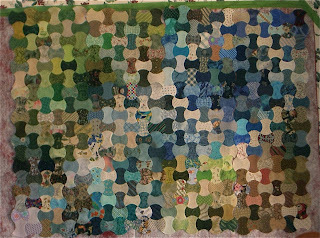 After cutting over a thousand 3" patches, I stitched them into four-patches, then the 4-patches were stitched into 9-patch blocks made up of 4-patches. 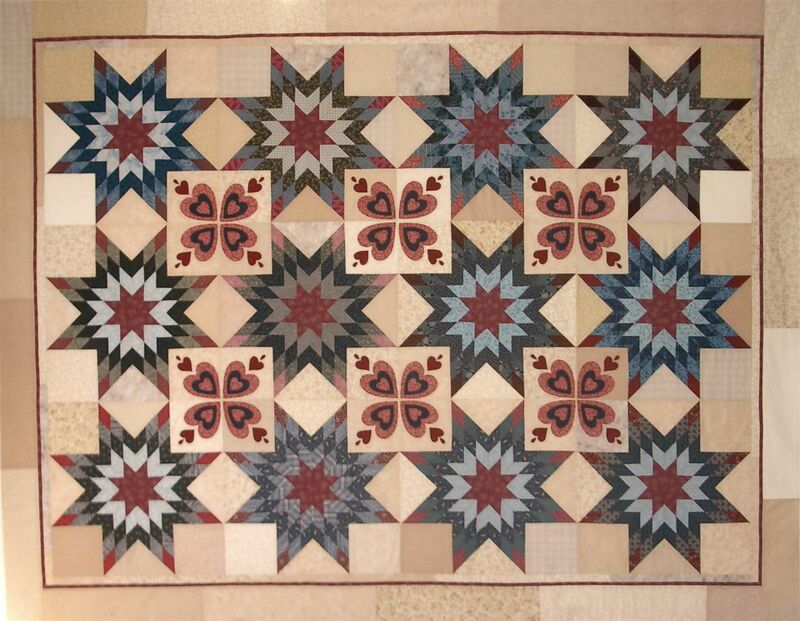 Curved piecing is requiring lots and lots of time, so I only have 13 of 30 blocks completed after several months of working on t hem. I am stitching them together by machine, and have found that it is only slightly faster than stitching them together by hand, but it is beginning to take shape. Here is one design option for these blocks. The jury is still out on whether I like this arrangement or not. What do you think? Simultaneously, I am working on another quilt design in which the block is made up of 45° triangles in the center with right triangles for corners. This one has been a lot of fun, and is quite a bit quicker and easier than the apple core charm quilt. I will write the instructions for the new one, and publish it in the next blog sometime later this week. 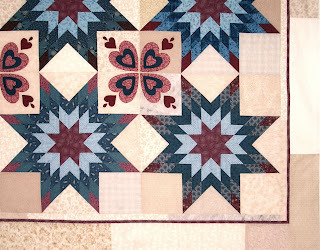 In the meantime, I'd like to offer you a Valentine's Day special from now until the end of February: A free Ruthie's Stars pattern with the purchase of any one of my 4 book titles from my website: Love Knows No Season, Winning Stitches, String Quilts, or Squares and Triangles. Ruthie's Stars features 12 Lone Star blocks with heart appliqué motifs in the corners. You can make it scrappy or you can purchase yardage to make your version of this queen bed-sized quilt. I chose a pink and blue color scheme but used multiple fabrics to make it scrappy.